Photo: Bishu stands with Paul Maxfield. 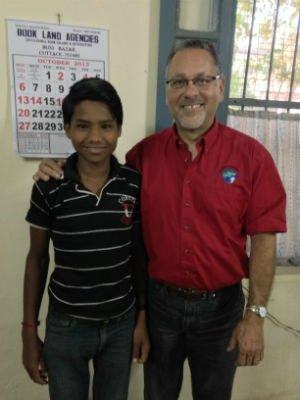 Bishu is one of many children whose lives have been transformed because of Children of Promise. Since 1992, over twelve thousand children have received nutrition, education, health care, and spiritual nurturing because of sponsors. Children of Promise has provided the funds for life-saving medical care, support during natural disasters, and advocacy for children who have fallen into difficult personal situations. This year is the 25th anniversary for Children of Promise: a major milestone in the life of this ministry of the Church of God! To celebrate the past and look forward to a brighter future, Children of Promise would like to invite all Church of God families to two special events. The first event is their 25th anniversary reception on June 17th at Madison Park Church of God in Anderson, Indiana. The reception will include a concert by their partner musical group, Alanna Story. There will also be a presentation by special guest, Jewel (Viray) Leodones. Jewel was once a girl sponsored for many years through Children of Promise. Now, she is the protocol officer for the president of the Philippines. The second event is a 25th anniversary banquet on June 21 at the Church of God Convention in Wichita, Kansas. 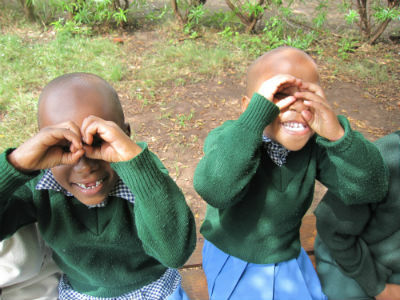 Children of Promise will have a display set up during the convention and will continue to encourage child sponsorship. The banquet itself will take place that Wednesday, June 21, at 4:30 PM at Central Community Church. Jewel Leodones will once again be the special guest speaker. At the banquet, Children of Promise will set aside time for an offering to propel the ministry into twenty-five more years of ministry. Children of Promise will also host the Thursday afternoon session of CHOG Convention 2017. Paul shared that Children of Promise has set four new goals during this anniversary year. The first goal is to increase the number of children being sponsored by 25 percent. The second goal is to enlist twenty-five new churches to engage in the ministry. The third goal is for twenty-five more people to graciously remember this ministry in their wills, to leave behind a legacy of compassion. The last goal and prayer is that the Church of God community would be generous enough to donate gifts in multiples of 25 dollars in honor of this anniversary. Any amount from $25 to $25,000 (and beyond!) will be encouraged and gladly accepted! Photo: Alanna Story in Ecuador for Children of Promise. Children who were once in similar situations of distress like Bishu are now teachers, doctors, nurses, accountants, and pastors because of the education they received. With access to an emergency medical fund, children who had serious medical conditions are alive and healthy. Children who used to have weak, malnourished bodies can run and play now because they have access to healthy food delivered every month. When sponsors live by faith and send their love and support to these children, lives are changed forever. So, come to one of these special anniversary events, or come to both. Celebrate the rescue, the healing, and the love that has saved children for the past twenty-five years. If you feel moved, become a donor or a sponsor for the next generation of children in need. Come and celebrate the past twenty-five years. Come and be a promise of hope for another twenty-five years. Learn more about Children of Promise at www.echildrenofpromise.org. Find more information and event registration at http://www.echildrenofpromise.org/ourevents/25th-anniversary/. 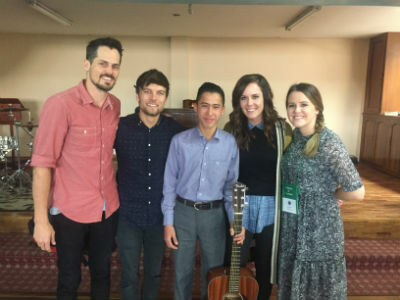 Emily Ploetz is an Anderson University student serving as communication intern for Church of God Ministries. This entry was posted in All Church of God and tagged 25th anniversary, Alanna Story, Anderson, Bishu, child sponsorship, Children of Promise, Church of God Convention 2017, Emily Ploetz, events, IN, Indiana, Madison Park Church of God, missions, Paul Maxfield, Reclaim 2017. Bookmark the permalink.